Cheating is never a smart move, but it’s especially unwise to attempt to fool a statistics teacher. 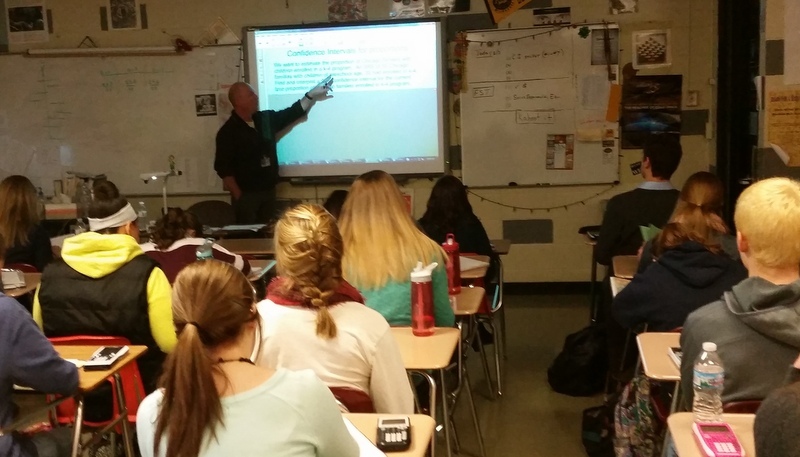 Rebecca Carmichael, a West math teacher, unraveled a cheating scandal in her AP Statistics classes in January. The scandal resulted in at least 22 students being accused of using an answer key found online to better their semester exam, and every AP Stats student was required to retake the assessment. On Jan. 14, Carmichael gave her students a long multiple-choice exam, allowing them to complete it in class the next day. One student decided to take advantage of the extra day, and wrote down a few questions from the exam with the intent of later searching for the test on the Internet. This particular individual came across the entire exam along with the answers. “One student came into class and said, ‘I heard this was online,’” Carmichael said. This was the only student, out of every AP Stats class, who said anything about the scandal to a teacher. Principal Bill Greymont found that troubling. “There is a responsibility for all students, whether they were involved or not. Students aware of what was happening should have explained the situation to an adult,” Greymont said. It did not take long for both AP Stats teachers to realize that something was amiss with their students’ scores. On Jan. 15, they started to analyze the statistics. At least 12 out of 60 students in Carmichael’s class were suspected of using the unethical method to ace the exam. In the other AP Stats class taught by Todd Brahm in East, approximately 10 out of 80 students were also under suspicion. “There were students that scored artificially higher than what they should have normally scored,” Brahm said. He explained that it is extremely unlikely that a student with a D in the class would earn an A on the semester exam. 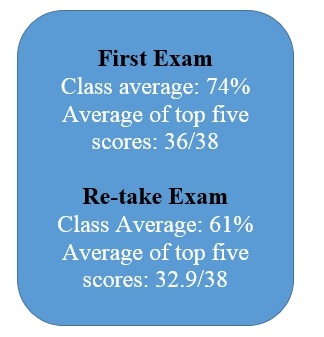 According to Carmichael, it is rare for any student to score better on the exam than they would have typically scored on any other test day. The impact of the cheating was especially apparent as the average score for the first exam was 74 percent and the retake exam’s average was 61 percent. According to assistant principal Dave Uelmen, there could be no punishment given by the administration for the cheating incident, as this was the first offense for many of the participants. The decision of proper punishment was left to the statistics teachers. Both Carmichael and Brahm said that they wanted to avoid a harsh punishment. “All I would wish for, if the student did make a poor choice, be a young adult about it and come approach me to make it right,” Brahm said. Carmichael agreed that an apology is a proper action for all students involved. Some students did apologize, and both Brahm and Carmichael were pleased that some participants decided to take responsibility for their actions. Some students who were caught were called down to the office to speak with Uelmen, who was evaluating the situation. Not all students spoke with Uelmen, due to the great numbers of involvement and varying levels of participation. “Some kids might think they got away with it, but we still know who they are,” said Uelmen. He encouraged those students to realize the fault in their actions and apologize to their teacher. There are multiple reasons why the teachers did not wish to inflict severe punishments, such as putting a zero in the gradebook or suspending each student. One problem with assigning a uniform punishment to each student is the fact that each student had a different level of participation in the act. If a standardized punishment was in effect, some students’ punishments could be far more harsh than necessary. Also, most AP Stats students are seniors who are close to being finished with their high school career. To Brahm and Carmichael, as well as the administration, it did not seem fair to place this occurrence on each student’s permanent record just to have the incident haunt them for the remainder of their lives. Carmichael said that if this situation occurred in college, the students would face expulsion. She made clear to her students that in the future the punishment for the same offense has much more serious consequences, so it would be wise to never repeat the act of cheating. A letter was sent home to each participant’s parents and teachers were also notified about who was involved. According to Uelmen, there were mixed responses from the parents. Some parents did see their child’s punishment as unfit, while others stood behind the administration’s decision. Students also had varying feelings towards their actions. Some students did not see their actions as wrong, but instead claimed that they were just “using their resources,” Uelmen said. Uelmen said that there is a distinction between using the Internet to practice skills and using the Internet to take answers from a test. Uelmen believes that the school truly cannot control student choices; students need to recognize their own limits and adhere to the rules. “This is a good opportunity for policing yourself,” said Uelmen. Brahm expressed his personal feelings of betrayal. “I feel betrayed, in a way, that a student wouldn’t trust that I have taught him or her well enough to score adequate on this exam,” he said. Both Brahm and Carmichael made clear that they felt proud of the students who chose not to abandon their moral integrity for an enhanced grade. The AP Statistics exams are curved, so students who had a decent grade in the class but chose not to cheat would receive lower scores. “The honest kids were being penalized for being honest,” Brahm said. Regarding the entire incident, Carmichael said that her two dominant emotions were both disappointment and sadness—disappointment in the students who cheated and sadness for the students who were not involved at all. “I had many students do well who didn’t cheat,” Carmichael said. Those students still had to retake the exam and risk doing worse than the first time. “Personally, the re-test affected me because I scored lower the second time than I did on the first. I wasn’t aware of the cheating going on and certainly wasn’t a part of it,” Courtney John said. John, an East senior, had studied hard for the first exam, and her original score would have raised her overall grade. “I don’t know how fair it was to make everyone retake the test, but I do get that teachers needed to make a decision that would be the same for all students,” John said. Why was the exam so simple to find online? “The fact that the exact same test was on the Internet with the answers is extremely concerning,” Uelmen said. According to Brahm, the test was posted online by a teacher from the South, who might have been unaware of the legal problems. The exam is a copyrighted test, so making it accessible on the web is illegal. According to Principal Greymont, kids sometimes make choices such as these that violate their integrity. He believes that it is a lack of long-term thoughts by students that causes them to overlook the seriousness of their actions. Overall, both the administration and the teachers hope that what students take away from the event is a lesson about the truth. “Being honest and living with integrity is what’s going to get you far in life,” Uelmen said. Hopefully the “statue of limitations” on this is up…when I was in high school, nearly everybody in my AP Gov class used the answers for tests and essays that were posted on the internet. Because teachers were using past AP exams, it was very easy to find the answer keys online. I don’t see this as cheating or being dishonest, as we were simply studying from past AP questions, which is recommended and encouraged to prepare for the AP exam. Handbook 2014-15 Parent/Student, page 6, Curriculum & Instructions, Grading Guidelines, number 9: Any student caught cheating will receive a grade of zero on the assignment or exam. What message is the teachers and the West Bend High Schools sending by not holding these students accountable for their choice and actions? Why is no one asking why all these things are happening? This school year has been filled with scandals and other negative events, far more than most years in recent memory. Why are situations being handled poorly all around? Riots that could have been isolated quickly, as there was prior knowledge about students being angered about policies. The reactions to these events by administration do not seem like normal responses. This cheating scandal doesn’t really surprise me, the students know that they can probably get away with it. The only thing that stopped them was their greediness, had they planned it better they could have gotten away with it this time and during the final exam. Administration needs to get their act together and treat situations correctly. Cheating is cheating plain and simple. If you think even for a moment what you are doing is wrong, then chances are very good it’s wrong. I thought we as teachers need to abide by the handbook. Making exceptions to the rule makes the rule unenforcable. Excellent reporting and writing by Ms. Paikowski. Better investigative journalism than Milwaukee Journal Sentinel. Has anyone questioned the laziness of the teacher who did not create her own exam. Isn’t that plagiarism?